Myanmar’s Sagaing region Chief Minister Dr Myint Naing-led ministerial team along with Manipur Chief Minister N Biren Singh along with his Council of Ministers on Sunday witnessed a friendly women football exhibition match played between Manipur Team A and Mandalay Team held at Khuman Lampak Main Stadium in Imphal. In the day’s match, the Manipur team A beat the Mandalay team by 3-1. The exhibition match was organised as a part of the Manipur Sangai Festival 2018 which has been underway since November 21 at different venues with Hapta Kangjeibung in Imphal as main venue. Minister of Security and Border Affairs, Sagaing, Myanmar Colonel Than Tun Aung, Minister for Development, Sagaing, Myanmar Myint Kyi, Minister for Social Welfare, Sagaing, Myanmar Dr Zaw Win, Minister for Youth Affairs and Sports, Manipur Letpao Haokip, Deputy Chairman Manipur State Planning Board S Rajen, MLAs Y Surchandra(Kakching), L Susindro(Khurai), N Indrajit(Kshetrigao), delegates from Myanmar, Convenor RK Shivachandra of state level Committee for actualization of Act East Policy and others also watched the exhibition match. Speaking on the occasion, Chief Minister N Biren Singh said that sports have the ability to bring people together which will eventually strengthen the relationship between the two regions. Recalling that women’s exhibition football matches were started last year which was followed by the visit of the Manipur Women’s football team to Mandalay and Sagaing for exhibition matches this year, he mentioned that closeness built through sports will continue and further deepen the relationship between the people of the two regions. Sagaing Chief Minister Dr Myint also spoke on the occasion. 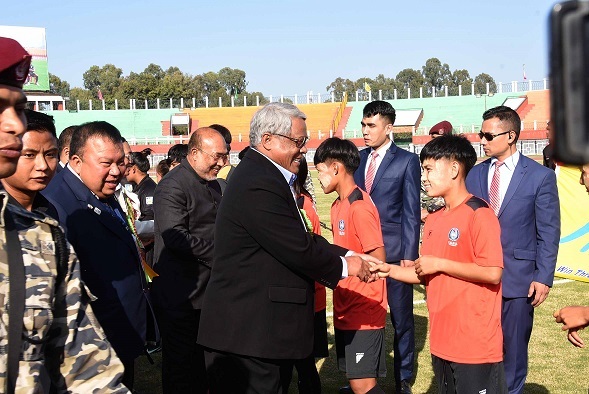 Later, Chief Minister N Biren Singh and his Sagaing counterpart presented wining and runners-up trophies to Manipur team team A and Mandalay team repectively. Earlier, Manipur women’s football team visited Myanmar and played friendly football matches with their counterparts in Myanmar’s Mandalay and Saigang province from January 27 to 30. Similarly, Mandalay women football team from Myanmar along with officials visited Imphal on November 23 last year and played exhibition matches on November 25 and 26 with Manipur women’s football team as part of exchange programme at the Main Stadium of the Khuman Lampak Sports Complex during the Manipur Sangai Festival 2017. Manipur team B will take on Sagaing team at Khuman Lampak main stadium on Monday.